Praise dancewear, worship dance attire, Dance Fashions Warehouse, worship dance dresses, praise dance dresses, christian dance wear, mens and boys praise wear, praise tunics, praise overlays, liturgical dance dresses, worship pants, worship tops, flamenco dresses,spirutial dance wear, cheap praise wear in Atlanta. - 574 Sleeveless Tunic. 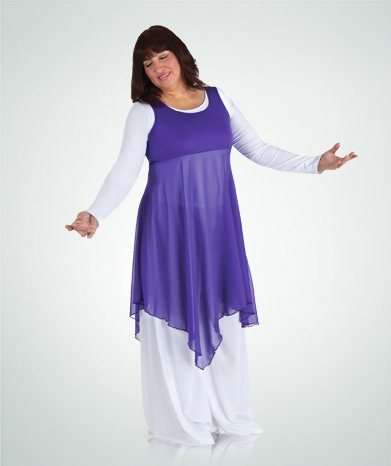 Sleeveless Pullover tunuc has a solid bodice with flowing chiffon handkerchief hem over skirt. Bodice: Polyester. Skirt.Nylon by Body Wrappers.